Each chapter of NIT assesses a country with regard to media independence, judicial framework fairness of jurisdiction, freedom of elections and levels of corruption. 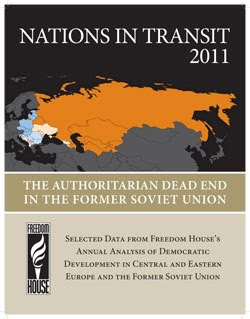 The overall analysis finds that the ever-growing tenures of authoritarian leaders in the former Soviet Union have contributed to a number of looming governance problems (e.g., including the inability to develop law-based systems or tackle corruption). As for the South Caucasus, Freedom House reports a deteriorating situation for Azerbaijan and Armenia in the fields of democracy and local governance. The assessment for Georgia is more positive. The country improved its ratings in democracy, national governance, electoral processes and corruption. Yet, Georgia’s judiciary was marked down due to persisting inconsistencies in interpretation, enforcement of legislation, and inhumane conditions in detention facilities for example. Recently, a nuanced article in an Indian magazine discussed "How Georgia Did It" to get rid of corruption. This has, of course, been a topic of extensive debate in India. It's good to see that lessons are being drawn from the Georgian case, and that they travel beyond the immediate neighborhood.